So far so good, although I have been having trouble receiving packages from amazon. It seems my address doesn’t allow them to deliver my packages. Thank you for taking the time to write a review. We appreciate your feedback and are glad you decided to call Heritage home. Great place to live. Friendly team. Clean outdoors. Quiet Community. Close to Restaurants. Mall and other stores, all in walking distance. Nice area. Thank you for your feedback and kind comments. We agree that Heritage is in a great location to many stores and restaurants. We appreciate your kind comments about Heritage and are happy to hear that you are enjoying living here. So far it has been great, despite a few bumps early on! My washer and dryer were malfunctioning, and after they tried to repair them and they didn’t work, they got me new ones almost immediately! It was an interesting start to living there because of that though. But the head of maintenance, George, is absolutely wonderful! He is incredibly responsive to emergency calls, and will call to check if your new appliance is working a few days after install. Also, if he happens to be the one fulfilling your work order, he will happily check out or help you out with absolutely anything you need help with! Having had previous horrible experiences with emergency maintenance and just the maintenance response (or lack of more accurately) in general at other apartments in the past, it’s truly refreshing. My only qualms are that I have had both mail and packages never arrive, despite saying they were delivered (some even saying that they were handed directly to me), and that I have to have a full on explanation of how to get to my apartment to pretty much anyone coming there, as it puts my apartment randomly on the side of the road when you enter it into the GPS (though once I figured that out, it became much easier to explain). Within walking distance of so many things, and not far from downtown or school for me, so I love it minus the few things from above. 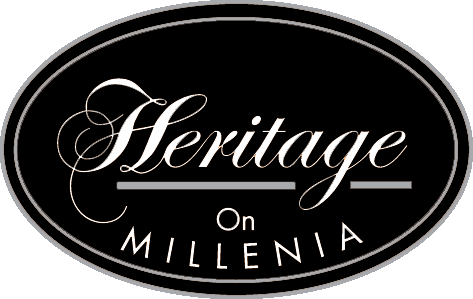 Thank you for taking the time to write a review on Heritage on Millenia. We appreciate your kind comments about George. We are sorry to hear about the issues you had with package delivery. Excellent place to live, great management. I love this place. The only complain is about parking lot and disabled parking place not enough.. Thank you for taking the time to give us your feedback. We are happy to hear that you are enjoying living here at Heritage and we are always open to ideas on how to improve the community and your living experience. Muy bueno todo ,las instalaciones son muy buenas ,el trato de los trabajadores es exelente , la tranquilidad y la segurida es tambien muy buena. Thank you for taking the time to review Heritage on Millenia. We are happy to hear that you are enjoying living here. Thank you for taking the time to give us your feedback. We are happy to hear that you are enjoying living here at Heritage. Thank you for taking the time to review Heritage on Millenia. We are so happy to hear that you are enjoying living here at our community. Thank you for taking our survey, your response is very important to us. A very quiet community to live in. The staff is extremely helpful. Neighbors are friendly and the community is very clean. Parking can be a slight issue as well in entering the complex through the gate. Thank you for taking the time to review Heritage on Millenia. We appreciate your comments. The community is very peaceful. If there is any problem the staff will help you to the best of their ability and the office is very friendly! Thank you for taking the time to write a review on Heritage on Millenia. We appreciate your comments. It is very convenient as everything is pretty close. Restaurants and grocery stores are walkable distance, theme parks are not very far and downtown too. Thank you for taking the time to review Heritage on Millenia. We agree that Heritage is located in a great area close to many restaurants and shopping. I have lived at heritage for over two years and love it! Everyone that works in the office is super kind and they are quick to resolve any issues. The community is very calm and quiet, with a lot of great amenities! Thank you for your kind comments. We are lucky to have such an awesome staff and we are honored to serve our residents. Thank you again for your comments, as well as your continued residency. I have lived here for almost 2 years & it has been a great experience. I love my apartment. I wish I owned this apartment. It’s a 1 bedroom but it is very spacious. The balcony is huge too! Thank you for taking the time to review Heritage on Millenia. We are so happy that you are enjoying the amenities. Thank you for calling Heritage home. So far so good!!! We love the staff, from the lovely ladies at the office and the maintenance guys, they are great!! Most of the neighbors are friendly, do wish people driving would slow down and actually stop at stop signs. Hertiage on Millenia has lovely rooms and services. The parking lot is always constantly full towards Millenia St side. Often times, vehicles park on the end of corners and restricts traffic. Thank you for taking the time to give us your feedback. We are always open to ideas on how to improve the community and your living experience. We understand that parking is tight in some areas of the community due to the size of the apartments in that area. We will continue to monitor and contact vehicle owners that are improperly parked. Thank you for taking the time to review Heritage on Millenia. We appreciate your kind comments about Maintenance and that you like the new landscape around the dog park. Also, thank you for your suggestion. We will make sure Maintenance checks the dog waste stations more often to prevent them from getting too full. The location is great, super quiet and very well located. The office staff are very friendly and kind. The maintenance people answer request right away. Thank you for your kind comments about the staff and location. I enjoy using the pool as well as the gym and business office. The staff are very friendly as well! My children loves the fact that the playground is near our building. Thank you for taking the time to review Heritage on Millenia. We are so happy to hear that you are enjoying all the amenities. Clean, safe, beautiful place to live! Nice amenities, great pool & outdoor patio with kitchen!! Very close to everything but still quiet and peaceful. We love living at Heritage! Thank you for taking the time to review Heritage on Millenia. We appreciate your compliments and are glad that you are enjoying living here. I’ve lived here almost two years now and overall I love it. Maintenance is always fast to respond. The grounds are well kept. For the area the price is great. The only reason I didn’t give five starts is the noise. I’m not sure if they did put enough insulation between the floors or if I just have extremely loud, inconsiderate neighbors but the noise is pretty unbearable sometimes. Thank you for taking the time to write a review. We are sorry about your unpleasant experience. Please know the office is always available to take your call and work with you to resolve any issues you may have. We want all residents to enjoy living here at Heritage.